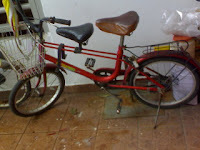 We have heard of tandem bikes and its problem, but a Malaysian inventor have just came out with a hybrid 3 seater bike! This bike only requires 1 person to pedal and control the bike while the rest (one in front and one at the back) are purely passenger. To make riding easy, its designed to be a single speed bike, plus an additional modern design carriage basket in front. It features 2 saddles for comfort riding will the third seat is a smart 2-in-1 concept seat, meaning it can be used as a seat, as well as additional storage. As the bike is meant for 3 passengers, it is not expected to travel at high speed, therefore no disc brakes are required and this will definitely help make the bike available to family of all levels in world. Wheel size have also been reduced to make it more economical to replace and maintain. The head of R&D, Mr.Tang tells us that this bike model will be marketed as J3000 and will be available sometime next year as the prototype are still being tested at its R&D facilities in an undisclosed location somewhere in Jinjang, Kuala Lumpur. Below is a pix of the current prototype and we can't wait to see it on the road. We bring greetings to you from Shelter Home for Children. We are going to have a charity climb to Mount Kinabalu on the 25th - 28th of April and we are embarking on the prospects of seeking the help of your organization to sponsor a portion of the cost for our event. Our aim is to raise RM100,000 to provide Education for our Children. We aim to increase the Standard of Education among the abused and abandoned children of Shelter Home. Knowing where they come from, it takes a greater effort than normal to reach out and educate these children. We are seeking your help and the help of your corporation to join along with us in this crusade of helping out with these poor and neglected children. So join us as we scale the heights of South East Asia's highest mountain!